While all marine reptiles are direct descendants of species like the crocodilian mesosuchians, a great number of reptilian species that lived in the Mesozoic era, also known as the “age of reptiles,” became extinct long ago. Among these prehistoric reptiles, most have evolved during the Jurassic period, although some species of reptiles have been around since the Carboniferous period, when the first reptiles evolved on Earth. No marine reptiles were dinosaurs, since no species of dinosaurs have evolved to live in the sea and ocean. Instead, most prehistoric marine reptiles include the ancestors of today’s sea turtles, crocodiles, lizards and sea snakes, and are known through species like the plesiosaurs and nothosaurs. Marine reptiles such as turtles, mosasaurs and plesiosaurs have left a significant amount of fossils behind for today’s scientists to study, leading to a greater understanding of their anatomy and evolution. Fewer marine reptiles evolved during the beginning of the Mesozoic era, with most of them appearing during the Jurassic and Cretaceous periods, up to about 65 million years ago. Mesozoic marine reptiles are most commonly associated with flying reptiles known as pterosaurs, species of marine fishes and diving marine birds, all of which had closely coexisted with prehistoric marine reptiles the likes of ichthyosaurs, placodonts, mosasaurs and plesiosaurs. Even though ichthyosaurs aren’t too well-represented by their fossil remains, they were among the most abundant species of marine reptiles during the Jurassic era. Growing up to 9 feet tall and featuring bodies similarly shaped as those of today’s dolphins, ichthyosaurs featured large tails designed to propel them through the water at high speeds, and were extremely well-adapted to marine life. 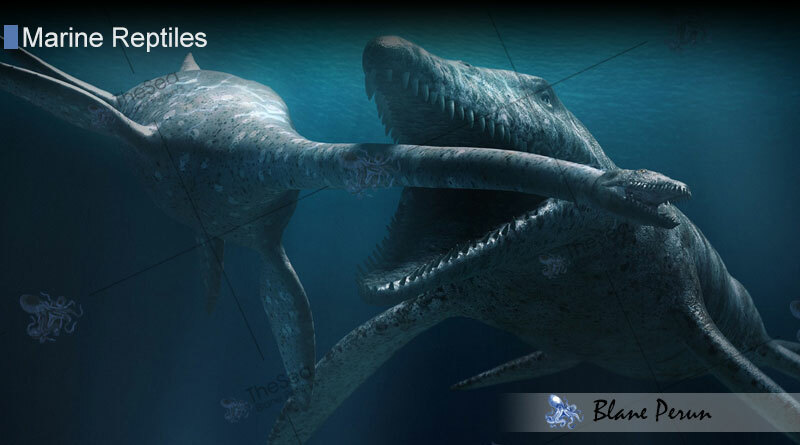 Another example of a well-known prehistoric marine reptile is the plesiosaur. These species were alive in great abundance primarily in the late Cretaceous period, and they have largely been classified into two major groups: long-necked elasmosaurids and long-headed pliosaurids. The former species were up to 34 feet in length, and are sometimes characterized as similar to the mythical Loch Ness Monster allegedly sighted in Scotland. The plesiosaurs and elasmosaurids aren’t the only large reptiles to have inhabited the Earth’s oceans by the late Cretaceous period. A recently discovered species that exceeded 30 feet in length was T. saurophagis, which scientists claim has been around since the Triassic era more than 240 million years ago. Liopleurodon was slightly shorter at “only” 20 feet in length, however, its jaws are known to have been up to 10 feet in length, and it is considered to be one of the most feared predator of the Jurassic era. 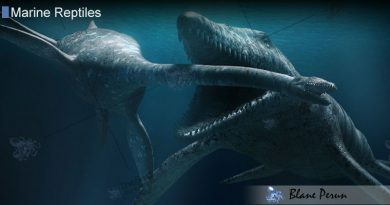 The mosasaurus is believed to be the largest prehistoric marine reptile of all, fossil evidence suggesting it could grow up to 50 feet in length.